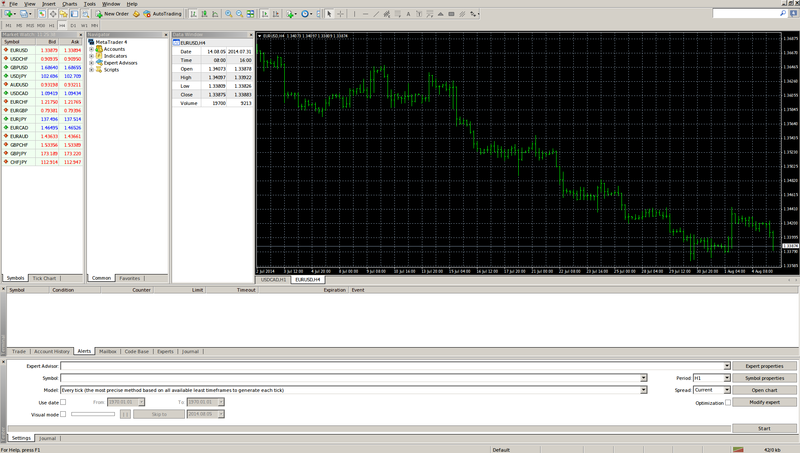 MetaTrader 4 is the most renowned and widely used trading platform that connects brokerage companies’ clients with the financial markets. Developed by MetaQuotes Software Corp., MetaTrader 4 allows users to trade in the Forex, CFDs (contracts for differences) and futures markets. Apart from providing you with a vast range of tools that will help you analyze the price and place and manage your trades, MT4 also allows for developing and employing of automated trading techniques. Many brokers around the globe use the MT4 platform, with or without adding any customization. Usually these brokers have a download link directly on their website, making it even easier for traders to attain the platform and install it. If not, you can get it for free from the developer’s website. And this is one of the main advantages of MT4 – you receive all of its analytical potential and the possibility to add even more custom-made indicators FOR FREE. Moreover, MetaTrader 4 is so stable and easy to work with, that due to its immense popularity many brokers who have created their own proprietary trading platforms additionally offer MT4 use and support to their clients. Undoubtedly there are many great proprietary platforms out there, but being familiar with MT4 will allow you to effortlessly switch from one broker to another, without having to spend several weeks in testing the user interface and system performance of each new software you encounter. On the screenshot below you can see what the platform looks like by default. – You can use all of its analytical power and potential for free. – Apart from providing a vast range of trading tools to aid your decision-making, it has a built-in programming language allowing you to create your own indicators and automated trading solutions (there are well over 1 000 custom-made indicators circling around the MT4 community forums which can be downloaded for free as well). – Due to its worldwide popularity, more than 300 brokers use MetaTrader 4 solely, or in conjunction with other trading solutions, including proprietary ones, making it easier to change brokers without spending too much time on adjusting to new user interfaces. – Because so many people prefer to use MT4, the vastness of the international community ensures feedback covering every possible problem or difficulty a trader might encounter, thus no question will remain unanswered. – Although it is most widely used to trade currencies, some brokers also provide the opportunity to trade commodities, stocks and indexes through MT 4. – Since every (or almost every) broker will offer the opportunity to open a demo account, you receive not only MT4’s software power for free, but you can test out your trading strategies for free as well. – Apart from virtual money accounts, you can also conduct tests by using the platform’s backtesting features. – Due to the fast growing popularity of smartphones and tablets, MT4’s support has expanded from Microsoft and Apple’s PC platforms (Windows and iOS), to their respective mobile versions and Google’s Android operating system as well. Thus, now you can trade Forex on your PC, laptop, smartphone, tablet (including the iPad) and the iPod Touch. The open-source Linux operating system is supported as well.